The Women in IT program supports women in the APS to progress their career in IT. Megan Henry talks about her experience and why working in IT is rewarding. 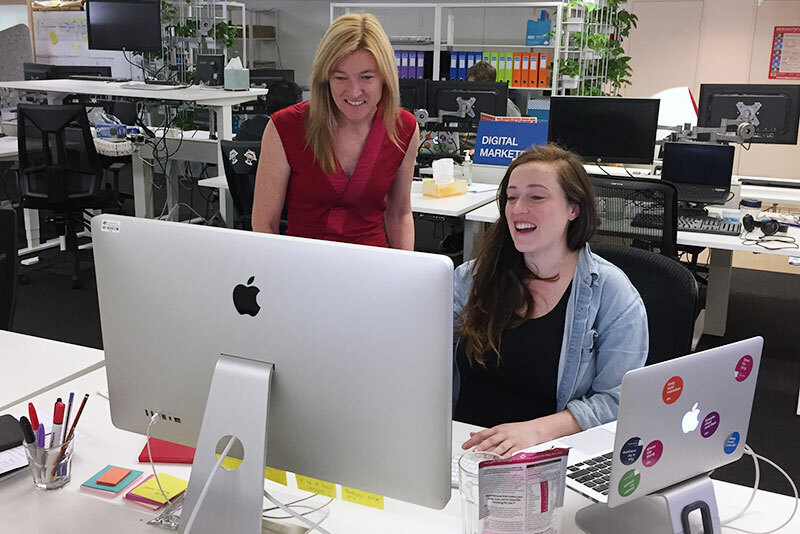 Caption: Megan and interaction designer Lou — looking at prototype designs. When I was little, I wanted to be an astronaut. As I grew up, I decided I wanted to join the air force. I put all my plans in place, worked really hard and achieved good grades. After meeting with the defence careers officers, I discovered that because I was a girl I was not able to fly fighters. This was the first time that I realised that girls and boys, women and men, don’t have equal opportunities — especially when it comes to careers. What seemed like a setback at the time, was actually a blessing in disguise. Because that’s when I discovered my love of computers. We had a Commodore 64, and I started to copy then later write my own little apps. This was the beginning of my career in IT. Things have changed since I was a kid. Women now have many more opportunities for careers and there are excellent female role models in almost every field. But there are still significant challenges especially for women in IT and women in senior executive roles. I was lucky enough to be able to participate in the Women in IT executive mentoring (WITEM) program. I was paired with a mentor — an APS senior executive working in IT. He helped me to navigate challenges. He helped me to understand how senior executive roles worked and how to be successful. It was great to learn from his experience and get an insider’s understanding of his role. In most of the teams I have worked in, I have been the only woman — particularly as I became more senior. My working style is often different to them. I prefer collaborative work with shared responsibilities — this doesn’t always go down well with my male colleagues. There are some men who love collaboration as much as I do but, unfortunately it hasn’t been common in the teams I have worked in. The WITEM program helped me to identify my own skills and working styles as well as those of my colleagues. By understanding my colleagues better, I was able to work with them more successfully to achieve our goals. I love working in IT and I love working at the DTA. It is great to be able to support the delivery of digital systems and products that make a big impact on everyone. We have the chance to really make a difference every day we turn up to work. For all the young (or not so young) women thinking about working in IT — I say do it. It is an extremely rewarding career. For women already working in IT in the APS — it’s time to take charge of your career. Take every opportunity you get. Tap into everything that you can to help you grow in your career. The Women in IT program is a huge advantage and can help you take that next step. Megan Henry is the acting head of ICT procurement transformation at the DTA.